Art and images from Echoes of Immortality (Nocturion), The Walking Dead: Something to Fear, Courts of the Shadow Fey, and Wingspan. 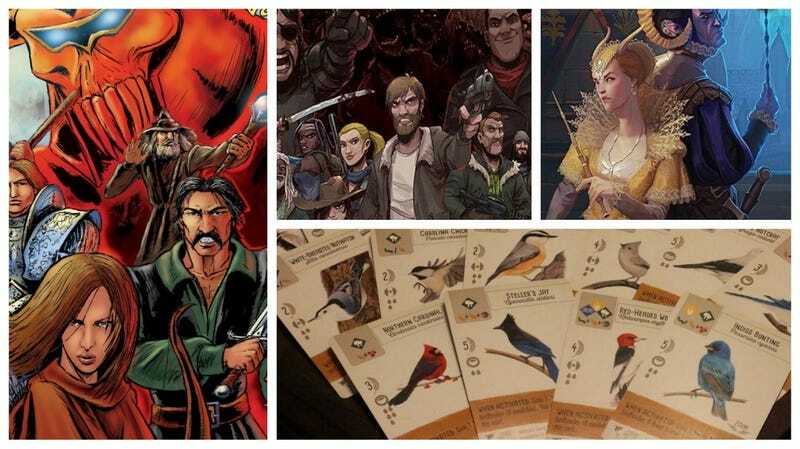 Welcome back to Gaming Shelf, io9's regular column all about the latest in board game and tabletop releases—focusing on the good genre stuff, though there are always exceptions! So far, it’s been a pretty dry 2019 in the gaming world, which is not really a surprise, considering how we’re now past the holidays and companies are saving their best stuff for later on in the year. Still, there are some cool things to highlight, as well as one sadder bit of news. The company that’s working to get Telltale’s final season of The Walking Dead completed is coming out with another TWD release. The Walking Dead: Something To Fear, from Skybound Games, is a simultaneous-card-selection game where players collect supplies and weapons to fend off a series of walker invasions—and possibly the occasional Negan attack. Players have to work together to avoid getting too much collective damage, which will immediately end the game, while also working against each other to score more points and emerge as the final winner. It’s both collaborative and competitive, a deadly combo. Something To Fear is currently available for pre-order, and is set to come out sometime in the next few months. After a successful run on Kickstarter, Druid City Games and Skybound Games are finally getting ready to release Guardian’s Call, a bluffing and deduction game where players compete to become the king’s new Guardian of the Realm. The king wants everyone to work together, but secretly you’re all plotting against each other, gathering and offering provisions to other players as “peace treaties.” But are you actually offering help, or trying to bluff them? It’s anyone’s guess. Guardian’s Call comes out February 21. Stonemaier Games, the folks behind Scythe, are coming out with a beautiful new release called Wingspan. Featuring an all-female design team headed up by Elizabeth Hargrave, Wingspan is an engine-building board game where players take on the role of bird enthusiasts who are trying to discover and attract the best birds to their nature preserves. Players collect birds to different habitats, gaining different bonuses, and the player with the most points after four rounds wins. The artwork is spectacular, the layout looks gorgeous, and it’s perfect for the bird enthusiast in your life. Admit it: We all know at least one. Wingspan is currently available for preorder and comes out March 8. Deep Water Games is bringing Scott Almes’ 2017 card game Claim to the U.S. As reported by Dice Tower News, Claim is a two-player trick game where, following the death of the realm’s king, players are trying to be the next one on the throne. You take turns trying to get followers and gain the support of one of five factions. Whoever gets more factions, wins the throne and the game. Claim is set to come out sometime in March 2019. In sad gaming news, it’s been reported that Darwin Bromley, the founder of Mayfair Games, died on January 1. Mayfair Games was the original American licensor of Settlers of Catan, which helped usher in the era of German-style board gaming in the US. The gaming company may have shuttered its doors earlier this year, but Bromley’s legacy in the gaming world will be around for many years to come. Fantasy Flight Games is continuing its King’s Landing cycle with the second chapter pack in the story, City of Secrets. The new cards continue your journey through King’s Landing and all of its palace intrigue, ensuring that no one is safe from the mysterious dangers lurking behind every corner. City of Secrets is currently available for preorder and should be released before July. Crystal Clans players have two new clans to try out! Plaid Hat Games has announced that the Gem and Moon Clans are now available on its online store, and should be hitting store shelves soon. I’m especially curious about the Moon Clan, which features a ghostly pirate crew. A new sourcebook for the popular Courts of the Shadow Fey roleplaying storyline is coming soon for Dungeons & Dragons 5E. As reported by The Gaming Gang, Kobold Press’ new sourcebook includes more than 100 NPCs, over 60 locations in the Court, and dozens of new monsters...including the King and Queen of Shadows. Courts of the Shadow Fey is set to come out on February 27. There are several new Battlestar Galactica: Starship Battle expansion packs from Ares Games that are coming soon. These include Starbuck’s Viper MK. II—a must-have for any Starbuck fan—as well as Scar’s Cylon Raider. They’re all currently available for preorder and should be out within the next few months. Imagine it: You’re on the high seas, enjoying the wind in your face—when suddenly, out of nowhere...you see a pirate ship and decide to attack! That’s right, Titan Forge Games’ Kraken Ataken! isn’t your normal piracy board game. Players take on the role of different kraken, who are all trying to sink the most ships and get the most treasure. You dual it out against pirates, as well as your fellow sea monsters, until one person claims the prize. Kraken Ataken! is already fully funded, and will be on Kickstarter through January 26. Still eagerly awaiting the final season of Game of Thrones? Nocturion, from Vesuvius Media might be just the thing to help you pass the time. This 2-4 player worker placement and resource management game has players take on the role of leaders of noble houses, each trying to fulfill different quests, find their heirlooms, and build armies filled with massive beasts and monsters. The game features artwork from Damien Mammoliti (Brass), and is based on the world created by Mark Alexander for the online game Nocturion. There’s also a companion graphic novel coming out called Echoes of Immortality. The board game has already been funded, and will be on Kickstarter through January 15. Ultima Dragons, an online community first formed in 1992 as a virtual club, has a community fanbase that lingers to this day, including with Adventure Post. Shawn Michael Hescock has created an Ultima-themed series of mini-adventures called Adventure Post, which will send a series of postcards that contain mini-games and quests, as part of a larger adventure story. Players create their characters and, over the course of 12 weeks, build to an epic showdown. It’s an interesting concept that pays tribute to the ongoing UDIC community. Adventure Post has already been funded and will be on Kickstarter through January 30. For those looking for something less story-based, but still challenging, there’s Rune. From Zemilio Entertainment, Rune is a two-player card game where players match up cards containing different patterns of rune stones. There’s a free version on Zemilio’s website too, for those who want to keep it a try before funding the campaign. Rune has already reached its fundraising goal, and will be on Kickstarter through January 28.